Here is a list of all academic peer-reviewed articles, reports and other papers published in July 2018 about journalism research. The bolded titles link to JRN articles written about the studies. Here is a list of all academic peer-reviewed articles, reports and other papers published in June 2018 about journalism research. The bolded titles link to JRN articles written about the studies. Note that the list may be incomplete. If you find that a publication is missing, let us know! Here is a list of all academic peer-reviewed articles, reports and other papers published in May 2018 about journalism research. The list is updated a couple of times per week. The bolded titles link to JRN articles written about the studies. Here is a list of all academic peer-reviewed articles, reports and other papers published in April 2018 about journalism research. The list is updated a couple of times per week. The bolded titles link to JRN articles written about the studies. Here is a list of all academic peer-reviewed articles, reports and other papers published in March 2018 about journalism research. The list is updated a couple of times per week. The bolded titles link to JRN articles written about the studies. Here is a list of all academic peer-reviewed articles, reports and other papers published in February 2018 about journalism research. The list is updated a couple of times per week. The bolded titles link to JRN articles written about the studies. Here is a list of all academic peer-reviewed articles, reports and other papers published in January 2018 about journalism research. The list is updated a couple of times per week. The bolded titles link to JRN articles written about the studies. Here is a list of all academic peer-reviewed articles, reports and other papers published in December 2017 about journalism research. The list is updated a couple of times per week. The bolded titles link to JRN articles written about the studies. 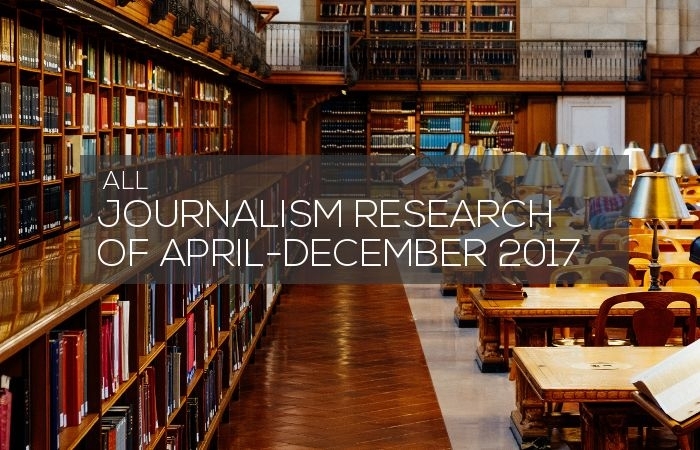 Here is a list of all academic peer-reviewed articles, reports and other papers published in November 2017 about journalism research. The list is updated a couple of times per week. The bolded titles link to JRN articles written about the studies.